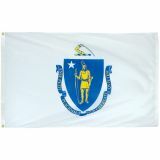 The state flag of Massachusettshas a blue, gold and white design on a white field with the state seal in the middle. The flag features an Indian in gold on a blue shield with a white star representing the United States above it. 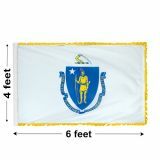 The Massachusetts State Flag was approved in its final form in 1971.Tuff Flags has in stock Massachusettsstate flags in different material choices like nylon and polyester. 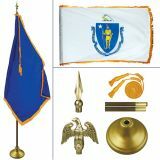 Choose from indoor, outdoor flags or complete flag kit at attractive rates. All our flags are industrial grade, 100% made in USA and come with 6 months guarantee on construction. Shop from our complete line of Massachusetts Flags right away and avail the best prices, quick shipping and much more! 100% customer satisfaction guaranteed! Show your state pride or love for everything that is truly unique to this part of the country including sports, love for coffee or even the freaky witches and ghosts. A state flag in your garden or atop your home is the best way to show how proud you are to belong to this state. We at Tuff Flags have flags of different popular sizes for you to make your state celebrations special. Offered in both premium quality 200 Denier nylon and 2 ply polyester, our flags are finished with grommets and heading and are designed to last long. If you are looking for a complete flag set, look no further than these brilliant masterpieces crafted in Oakwood, which will make a spectacular indoor flag presentation. Browse our complete line of Massachusetts Flags at Tuff Flags and grab the beat deals. Need help? Call us at our toll free number (888) 287-3524 or email at customercare@tuffflags.com.